Saint Elizabeth Ann Seton is the first native-born Roman Catholic saint of the United States. She was born in the area of New York City in 1774 and died in Emmitsburg, Maryland in 1821. A beautiful and popular debutante, she married William Magee Seton at the age of nineteen and had five children. After her husband's death in 1803, she decided to convert to Catholicism. She was then rejected by New York society and became a penniless widow. Her faith in God enabled her to persevere and triumph over difficulties. Today she is remembered as the pioneer of the United States' Catholic school system and the foundress of the American Sisters and Daughters of Charity. By means of her sanctity, her inspiring legacy is accessible to everyone. Portrait of Elizabeth Ann Seton: Courtesy, Daughters of Charity Province of St. Louise, St. Louis, MO. Photos about Elizabeth's life and how they relate to us today. Lower Manhattan in the early 1800s. Governor's Island is at right. The same view of Lower Manhattan today. Elizabeth's house is in the middle at the water's edge. recognized God in the beauty of nature. She would feel God's presence there for the rest of her life. Elizabeth's love of music and dancing was evident during her days as a popular debutante in the late 1700s. She always kept her dancing shoes, and you can see them today at her Shrine in Emmitsburg. God as a Father brought her comfort and joy. Elizabeth and William Seton were married in 1794. After her fifth child was born in 1802, William's tuberculosis worsened. Elizabeth, William and their oldest daughter traveled to Livorno, Italy with the hope that he would recover his health. He died in Italy in 1803, and Elizabeth was drawn to the Catholic faith. She passes Gibraltar on the way. Back in New York, Elizabeth converts to Catholicism. She and her five young children become isolated and destitute. Once a resident of the fashionable Wall Street, Elizabeth now walks in the direction of uncertainty. Elizabeth moves to Baltimore in 1808. 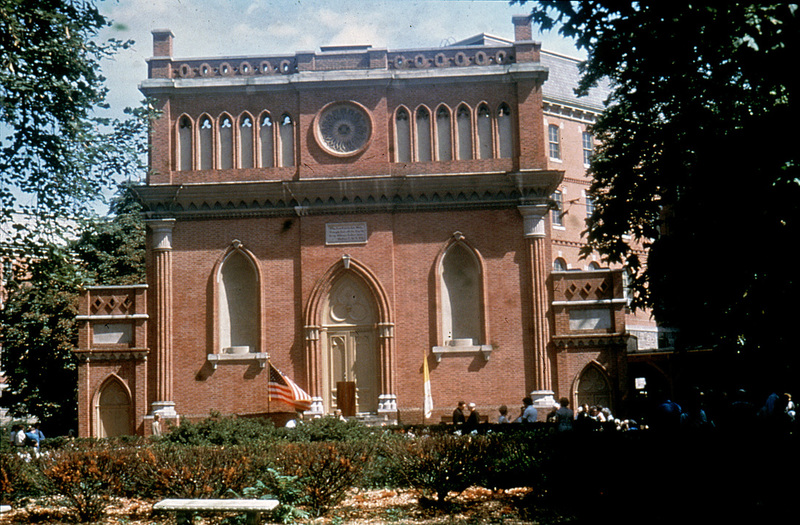 The Sulpician fathers founded the first U.S. Catholic Seminary there in 1791. At left is the Mother Seton House in the early 1800s. Drawing of Paca Street House in Baltimore: Courtesy, Daughters of Charity Province of St. Louise, St. Louis, MO. Elizabeth's lap trunk, which accompanied her on her travels, is now on display in her Baltimore house. 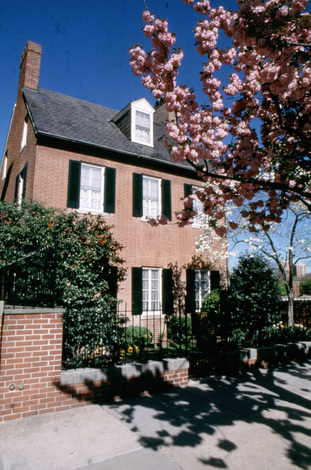 Today the Mother Seton House in Baltimore remains the cradle of the United States Catholic School system. Elizabeth started her first Catholic school for girls there in 1808. She also gathered the first group of her Catholic sisters, who moved to Emmitsburg in 1809. In the Lower Chapel at Saint Mary's Seminary, Bishop Carroll first called Elizabeth Ann Seton, Mother Seton. Elizabeth moved to Emmitsburg, Maryland in 1809. It was here that her mission in life grew and became glorified. Her relics are entombed in the Altar of Relics in the Basilica of the National Shrine of Saint Elizabeth Ann Seton in Emmitsburg. was canonized on September 14, 1975. Her Feast Day is January 4th. She was declared the Patroness of the United States Sea Services in 1975. In 2006, she became a Patroness of Maryland. Throughout her life, Elizabeth focused her thoughts on heaven. At the end of her life, she wrote: "It is all for you, my God." (CW, 3a:257) That is how and why she accomplished so much on earth. please visit her former homes at these websites below. The Mother Seton House in Baltimore is where I first met Saint Elizabeth Ann Seton. This site at 600 North Paca Street is less than a mile from Baltimore's Basilica and less than two miles from Baltimore's Amtrak station, baseball and football stadiums. The Shrine in Emmitsburg is over an hour's drive from both Baltimore and Washington, D.C. It is about a half an hour's drive south of Gettysburg, Pennsylvania. The Federation includes the Sisters and Daughters of Charity. I am an Associate of this congregation. written from her house in Baltimore. Unless otherwise indicated, all photographs are copyright, Anne Merwin, 2003-2015. Bible verses are from The New Revised Standard Version Bible, Catholic Edition, 1993. 3 vols. (New City Press: New York, 2000-2006), (vol. #:page#). Hereafter cited as CW.